Coming up with great ideas for corporate gift can be challenging. Get rid of those boring stuff like pens and notepad with branded leather product. ODM recommends this classy excursion garment bag! You can put your business suit inside, along with other documents and even laptop. Useful and practical, this gift will definitely please your business partners. What’s more, ODM can customize this to meet your need! Who can I give this branded leather bag to? You can target working adults from 35 to 55 years old. Of course, working adults outside this age range can use this bag too. However, as a corporate gift, this suits executives of relatively high position. They normally fall in this age group. Leather also gives a sense of exclusivity. Therefore, mass producing this for all the employees in your partner’s company may not be the best idea. You can show respect and appreciation to your partners by giving them a high-end gift that is different from those gifts for their employees. This can also be a great gift for your global partners. Being in a multinational corporation, it is a sure thing that they are required to travel often. Many times, it was only a day trip to visit a branch office or short meetings with their regional team. 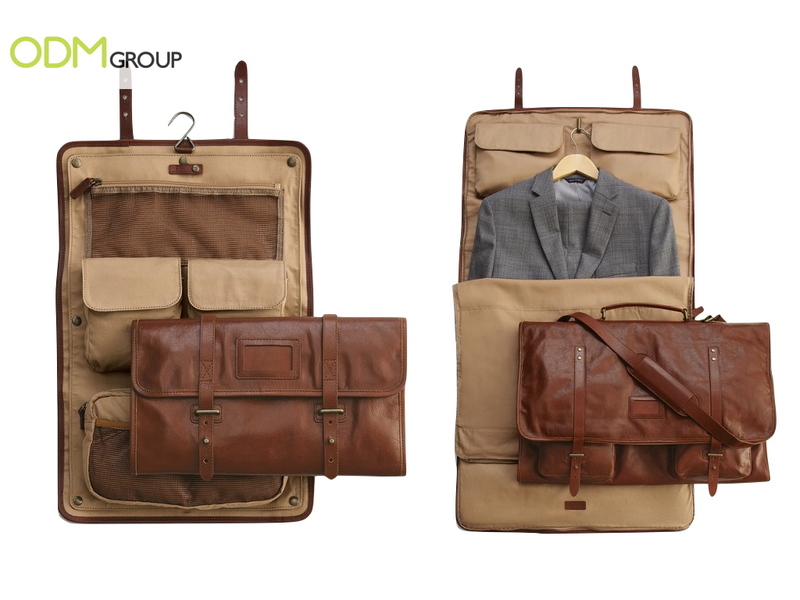 This bag is so useful as they can fit their personal items and business suit inside. Not only that, they can fit important documents or laptop in another layer. What can this branded leather bag do to my business? This leather bag has a high perceived value. Surely, your business partners will appreciate your generosity. This is a boost to your brand image. Not only that, these bags are very useful. They may use it often and it will remind them of your company. Subtly brand these leather bags to enforce brand recall. If your business partners bring these bags into their meetings, it may attract attention of others who will notice your logo. Now your brand awareness is increased as well. How can you customize the leather garment bag? In addition to your brand logo that goes debossed to the leather, you can choose the color that matches your brand spirit. 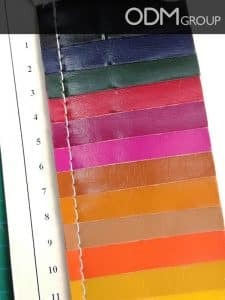 Take a look at the different color swatches you can pick and style your perfect leather garment bag. Leather is such an expensive material, isn’t it? That is exactly why it has high perceived value, but that is not the end for low budget projects. Today there are many kinds of synthetic leather. Some even look and feel almost exactly like a genuine leather. Although they are not genuine, they still have relatively high perceived value. Some environmentally friendly people may even prefer a synthetic leather than a genuine leather. You can also customize the compartments and the interior material. Isn’t it a great idea?